Welcome to our 2016 CSA season! Salad Mix - 2 bags! 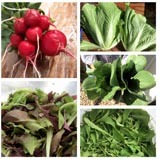 *Arugula is a rare treat from EverGreen Farm. We get it for one, maybe two, weeks of the year. Plants are very picky about their growing conditions. About 1/4 of the planting grew to a decent harvest size, and about 1/4 is already bolting (flowering). Hoping it gives us another week? Now, the difficult decision is to how to enjoy it? As a salad, mixed with salad greens, or to make Arugula Pesto? 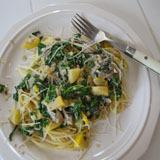 (Arugula Pesto recipe available on our blog, click the Recipe Link on the left column.) I am rather fond of Arugula on an egg salad sandwich! But Arugula pesto is fabulous too. I took a nice walk around the farm yesterday (checking water lines) and as I looked inside each of our 7 greenhouses, I am in awe at how much has been accomplished. All but 1 of our greenhouses are planted, and the last will have plants going into it in just a few days. Each greenhouse represents countless hours of weeding, ground preparation, starting seeds, planting, more weeding, and now moving into harvesting. I can tell you a lot of care and effort goes into all we do here. It's going to be a great season. I've been attempting to post daily farm photos and updates to our Facebook and Instagram. Links are on the right. Please check it out. You don't have to be registered with either website to be able to scroll through the photos and brief posts. Please call (884 - 6423) or email me (tara @ svwy . net) if you have any questions about the weekly pick ups. Have a great week and ENJOY your greens!